Alterations in lymphatic network function contribute to the pathophysiology in cancer and infection. However, there are limited tools available to directly measure lymphatic vessel function and transport in vivo. Existing approaches such as fluorescence recovery after photo-bleaching (FRAP) require injection of exogenous labels which intrinsically alter the physiology of the local lymphatic network. A label-free approach to imaging lymph fluid flow in vivo would provide direct and unaltered measurements of lymphatic vessel transport and could catalyze research in lymphatic biology. We developed and validated the use of Doppler optical coherence tomography (DOCT) to measure lymph flow in vivo at speeds as low 50µm/s. Unlike blood, lymph fluid is highly transparent. 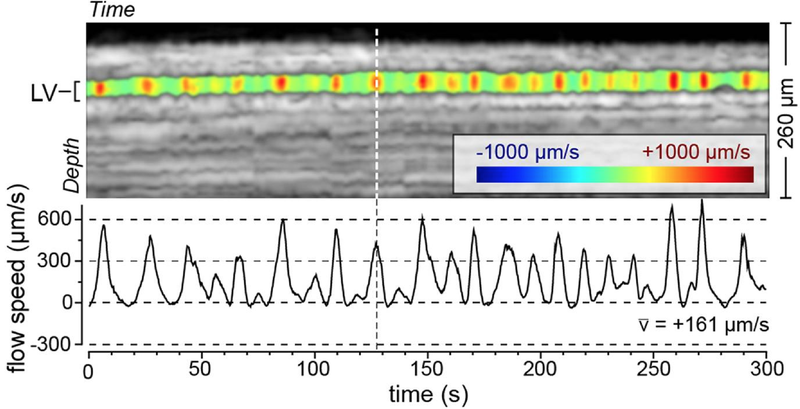 We demonstrated that the small but detectable scattering signal from lymph can be used to extract flow using a dedicated algorithm optimized for Doppler analysis in low signal-to-noise (0 to 6 dB typical) settings. With this tool, we demonstrated the label free measurement of lymph flow in the hind-limb of mice with a temporal resolution of 1s and with flow measurements that agree well with prior literature reports. We anticipate that DOCT can become a powerful new tool in preclinical lymphatic biology research with the potential to later expand also to clinical settings. In the presented figure, the M-mode depth-resolved pulsatile lymph flow is shown (upper panel) with quantification below (from Ref. 1). Blatter, C., Meijer, E. F. J., Nam, A. S., Jones, D., Bouma, B. E., Padera, T. P. & Vakoc, B. J. In vivo label-free measurement of lymph flow velocity and volumetric flow rates using Doppler optical coherence tomography. Sci. Rep. 6, 29035 (2016). Meijer, E. F. J., Jeong, H.-S., Pereira, E. R., Ruggieri, T. A., Blatter, C., Vakoc, B. J. & Padera, T. P. Murine chronic lymph node window for longitudinal intravital lymph node imaging. Nat Protoc 12, 1513–1520 (2017). © 2019 Center for Biomedical OCT Research. All Rights Reserved.